I was suspicious, but they were old. A week later, I got the same news from my daughter in a panicked phone call...something about emptying the dishwasher and handles popping off. Clearly I needed new dishes. 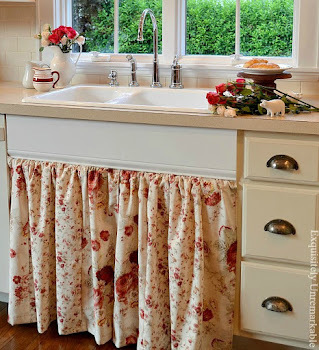 I had purchased them about fifteen years ago, when we renovated the kitchen, and I wanted something functional but attractive to place in my new glass front cabinets. I went with Emma in yellow from Pottery Barn. They looked beautiful, added a hint of warm color to the room and were sturdy enough for everyday family use. Perfect. Until now, which was great, because lately I've been toying with the idea of white dishes, a cleaner cottage style look and a more uniform color palette. Like most people, I started my search online and pretty soon, I ended up at Pottery Barn. Again. You see, I worked there in the 90s over the summers when I was teaching. I'm familiar with their brand and I really do like the dishes. Plus, the set I had held up well, besides a few lost bowls and handle-less mugs they looked great. Took my kids from toddlers to teens. I think that says something. There were a lot of sets, but I fell in love with the Cambria plates right away. Rustic, simple, available in white and sturdy enough for my not so careful family. Done. Or maybe not. You remember those gorgeous glass cabinets that house my dishes? Yeah. Well those cabinets are not deep enough for the Cambria dinner plate. It measures in at a whopping twelve inches and the doors would never close. Bummer. The set is very unique, as the dinner and salad plates aren't matched. The cereal bowl is dainty with gentle curves and I thought, this is it, but my husband, knowing my penchant for returns and how what you see online isn't always what you get, said let's see it first. So we took a drive to the outlet with great anticipation...found one salad plate, one mug...and didn't like them at all in person. BUT we loved the Cambria set and decided to go with our gut and get most of the pieces and worry about dinner plates later on. 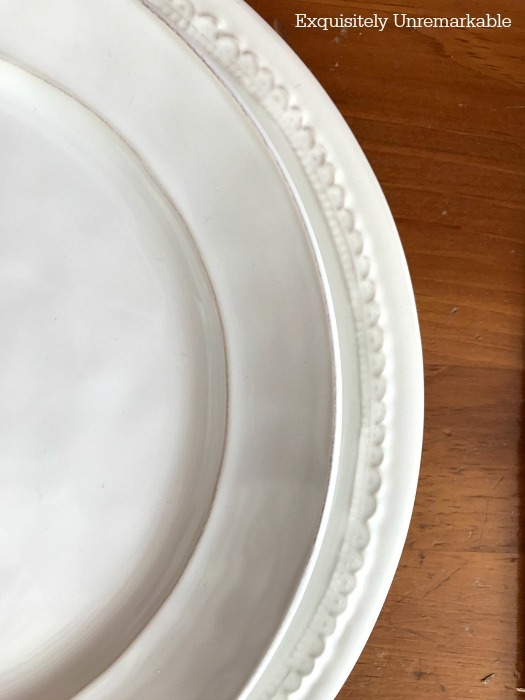 We poked around some other stores and looked online again, but something kept telling me that the Pottery Barn Napoli dinner dishes would go really well with my simple Cambria pieces. I didn't see those in person, so I rolled the dice and ordered them. Turns out, I was right. They look fabulous together. They are basically the same color tone, they are both stoneware and they each have a tiny bit of brown accenting. 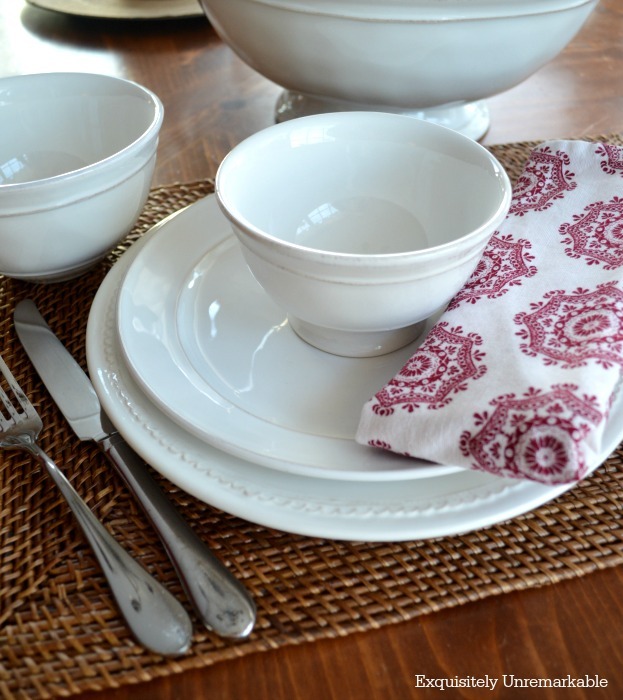 The simple straight lines of the Cambria are set off by the gentle ruffle on the Napoli and I think it makes the entire place setting quite elegant. There really aren't a lot of rules when it comes to mixing plates, go with what makes your eye happy. Most importantly, I love each piece on its own. Let's face it, when you go into a store or check out their merchandising photos online, the table is set to the nines, with pieces overlapping one another. Who eats like every day? We normally just grab a bowl or a plate for a sandwich or snack and for dinner, it's a few large plates on the table. I think finding a dinner dish that mixed well, but held its own was the biggest challenge. I bought the cereal bowls and a large fruit bowl at the outlet for a song and picked up the rest of the pieces during a super sale, no shipping. 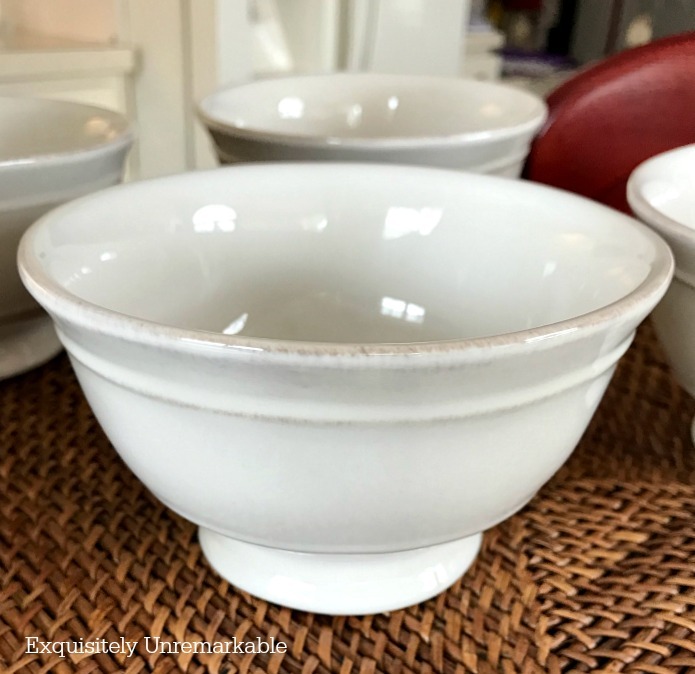 When I popped back in the other day to return a different group of dinner plates I tried out, I couldn't resist these footed bowls. Aren't they the sweetest? I know there are a ton of photos today, but like I said, when I was looking for real life pictures of these particular plates, there weren't any, so I decided to share mine. It's hard to order things online and I'm always looking for as much information as possible before I buy. Perhaps this will help someone else in the same boat. 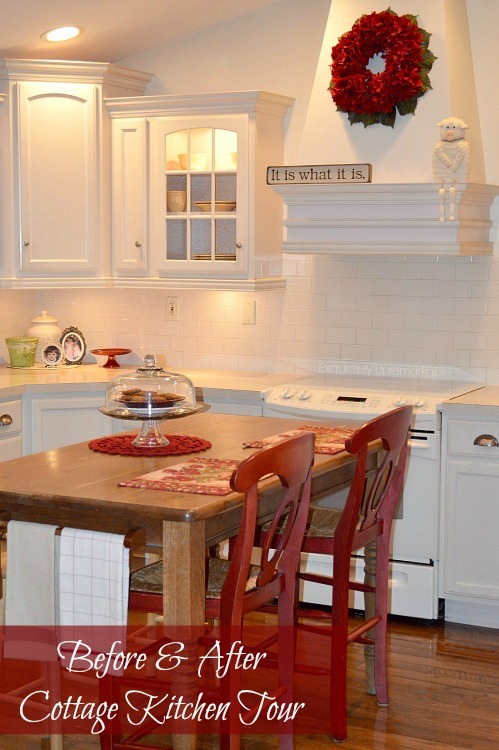 My plate tale ends with two glass cabinets filled with an array of white dishes that fit. The look is clean, crisp, simple. And all the mugs have their handles. Of course, no one is allowed to use them yet. But that's a story for a different day! What color are your plates? Looking for more plate fun? Lovely dishes, you made a great choice. I agree, mix and match. You got a lot of use out of your old dishes. I wonder if putting them in the dishwasher shortens the life span a bit? I know putting your clothes in a dryer (which I don't have) shortens the life span of clothing. I love how you style photos! I never seem to have these ideas for mine. Thank you, Brenda! You are always so kind…and yes! I think that frequent dishwasher and microwave use definitely had something to do with the dishes cracking. I don’t use the heating element on the dishwasher, but it’s hot water. I can’t imagine that repeated exposure to either of those things helps longevity. I love white dishes! Yours are great and they play nicely together! Thanks so much, Deanna! I am really happy with the combination! I am a dish junkie. Always have been. Never could turn down a set that appealed to me, mostly from rummage sales or yard sales. White dishes are my new love.Do I need another set of dishes? no. Do I want a white set???? You bet. On a tight budget, but the search is on. I am addicted now, too. Oh boy, I am not sure this little cottage can house anymore plates, but they are sure are pretty and hard to resist! I feel exactly the way you do and my search is on as well!! Enjoy the hunt! Tone on tone is always a perfect and classic setting. Beautiful especially in white! Thanks so much, Vel. And I agree, tone on tone is so elegant! Kim the new plates are fabulous. I love that you could marry your dishes with the new plates. Happy Friday. Have a fabulous weekend. Thanks Kris! I have had fun playing with them...hugs!! We have a sweet cafe in my area. They use all mismatched dishes, mugs and silverware. It is the charm of the cafe. We have a cafe like that around here, too. It's a coffee shop where the kids sing occasionally. I love going there, for many reasons, but it's always fun to see what kind of dish I'm going to get! 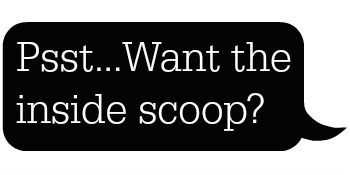 And oh no, the French Press? It happens...poor sweet kids. 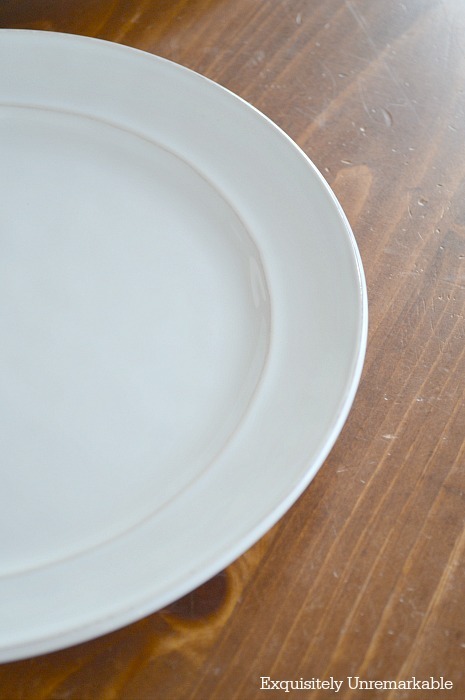 as you already know I love simple white plates so much I never have anything else! and I never tire of them. 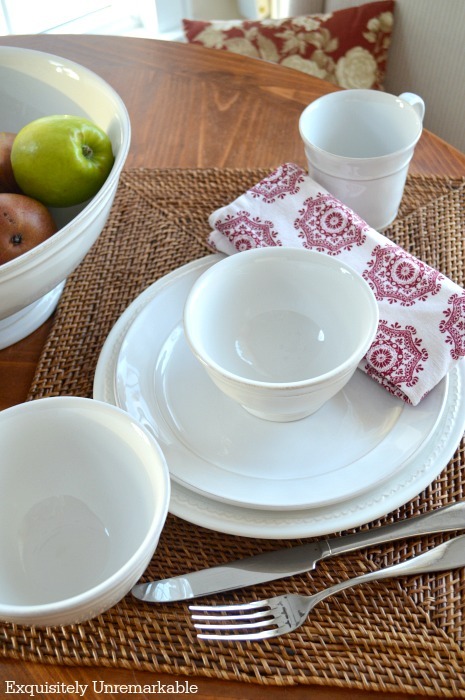 when I broke my left wrist and hand some years ago I switched to Corelle. simply because they were lightweight. I couldn't handle the heavy (heavy to many broken bones anyway!) white ironstone. bought a set of white corelle and have never looked back. I've been totally happy with them. and a nice little bonus... they don't break very easily! I knew you'd like this one, Tammy! And I had Corelle in college and growing up. You're right, it was indestructible and classic in pure white. Perfect. So pretty!!! I kind of wish I bought white dishes back when I got mine, but nope - it was fall and I went with warm, fall colors. Oh well, I do love them in fall, and since I have service for 12 plus a bunch of serving pieces in a coordinating color, there's no way I'm buying a new set!! Enjoy your new dishes, my friend! I love color, Debbie and have always had colorful dishes. As a matter of fact our last set was service for eight in a golden yellow and I bought a service for four in the same set in a deep red. I mixed and matched and it was gorgeous. Time for a change now, but I still plan to bring in the colors when fall rolls around. Enjoy your dishes, too!! I love them! They mix and match perfectly and look nice on their own too. My plates are white, but I got them a few years ago when square plates were in. I still like them, but I like yours better! Thanks so much! I think while plates are classic and I bet yours are beautiful, Mari! 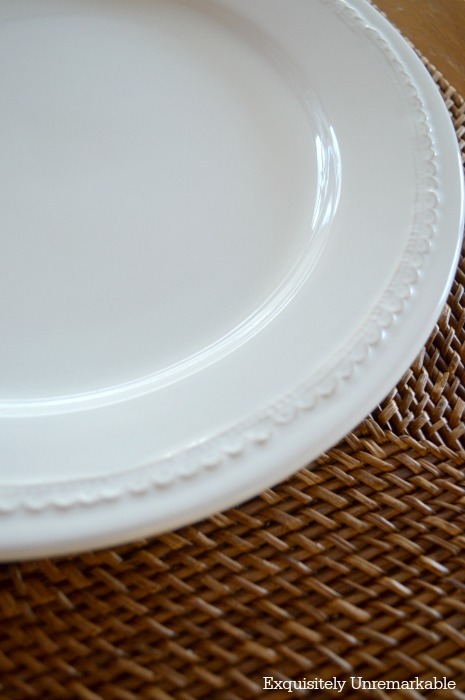 I love all white dishes, especially the ones with embossing on them. Good choices on your part, IMHO! Thanks so much! I really looked around, there are so many pretty choices. So far I am still smitten! 😉Thanks for weighing in, Mary. I do like white dishes. Yours look great - good choice. Thanks Jan! I really do like them. And one of these days, I'll let people actually use them. Just kidding... kind of. I love white stoneware and your dishes are elegant and cottagey. They do look great together. I am embarrassed to say that I use melamine dishes from Wegmans. They hold up great, go in the cupboard where no one sees them, and they don't break against my porcelain sink! We were in PB and my husband saw the most beautiful dishes and said, we should get these! They were melamine. Then I did the same thing in Pier One. There really are some beautiful versions out there and you're right, they really hold up! I love white dishes and your new ones are so pretty. Love the plates. I like the the look of mixing the dishes. My plates are white!!! 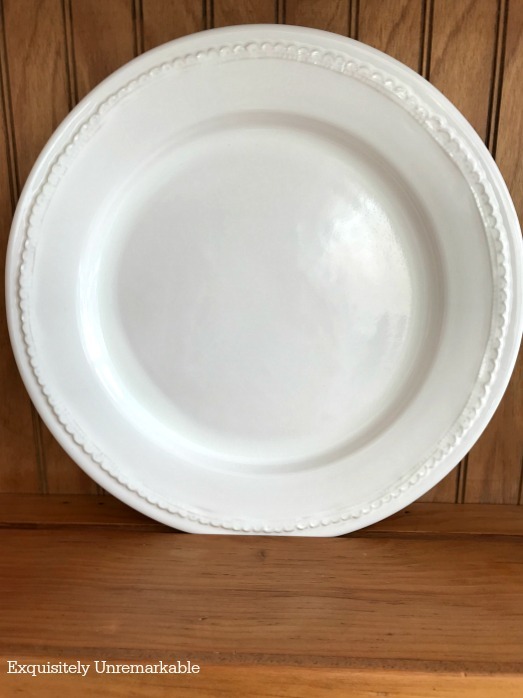 I love white plates, they leave the colors of the food to be speak louder. I love a set that I inherited from my mom in law which is kokura ware -snowcrest. I am missing one cup and would love to find sugar bowl, creamer and tea pot. It's hard to find it. I absolutely love your plates. I like the mixing of plates. Love it!! Oh Angela, lucky lady. I just googled them and they are beautiful. What a classic and elegant pattern! Have you tried Replacements.com or Etsy? Sometimes you can get lucky! Love it all, especially those footed bowls! Great choices! I couldn't resist! They were just too darling to leave behind. Thanks Deb. They are my favorite. You chose well. White is a classic but also very practical. 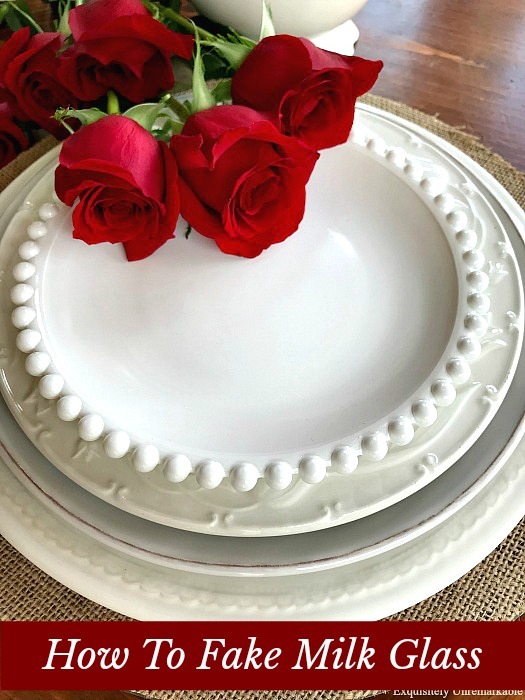 At some point you could add a colorful or seasonal salad plate or serving pieces for a whole new look without having to buy another whole set. I also think that food shows off best on a plain white backdrop. Very nice. I also think the footed bowl is so sweet. Good job. Thanks Lorri! I know that you you are a dish collector. I have to say that I really have fallen in love with white. 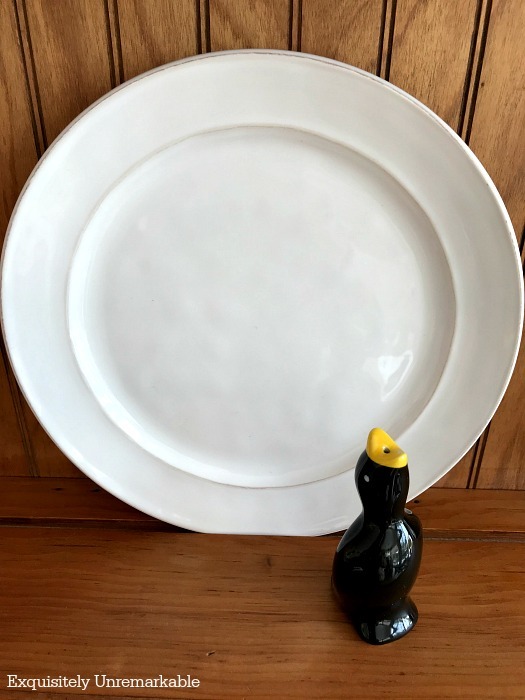 I have a ton of patterned plates to mix with them and as a lover of bold color I didn't think I would ever appreciate the simplicity of white. I am hooked now. And as you said, I can still use all of my other plates to compliment the new white ones! Best of all worlds. Beautiful , I love the way they look together . Enjoy! So pretty & very classic! They look beautiful, Kim! Mixing different patterns of white is such a good idea and perfect no matter what the season. I have Fiestaware and no two place settings are the same color. It’s so much fun coming up with different color combos! Enjoy your new dishes! Hi Carol! Thanks so much. 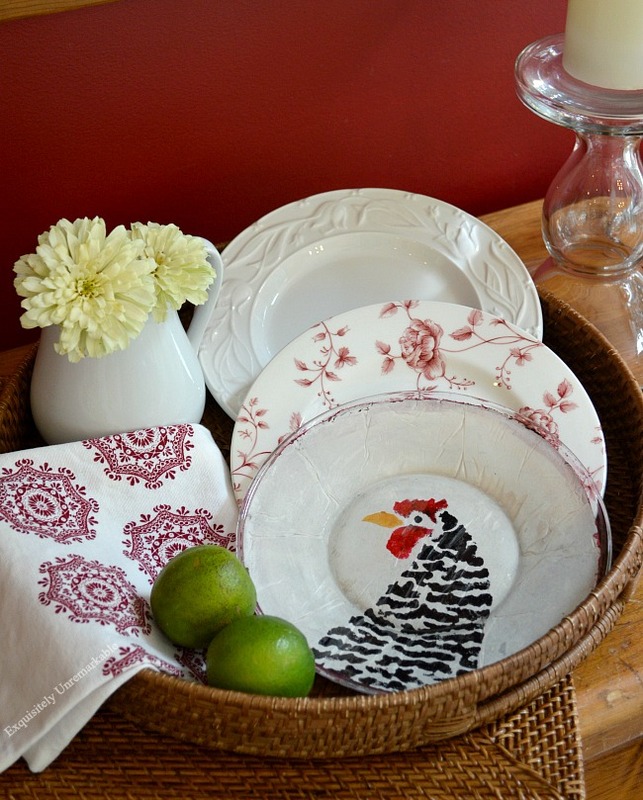 I love mixing patterns and colors and Fiestaware is a classic. I did consider it on my hunt. I was drawn to it in every store we went in. The best part is that I can still get pieces of it and mix it with my white. Best of both worlds!! Hugs! Such a great idea to mix and match like that, Kim. You just can't go wrong with white. I had read reports that the Cambria dishes are too large for most cabinets so I walk on by. I do love the look of them though. Our dishes are from about 2000 and we are down to 4 saucers. I don't even worry about it usually but when we have friends over for dinner or something, the problem comes back to me and I have to scramble. I remember looking at Cambria years ago, loving them then, but settling on Emma, because Cambria was too big. I guess I have steady taste, because they still caught my eye. Honestly if I didn't have the glass to contend with, I would've purchased them and placed them in a corner cabinet. Of course, then I wouldn't have this pretty combination!! Your dishes coordinate well. I especially like the footed bowls. I’ve had two sets of dishes where everything matched, but I eventually tired of them. Now I, too, have embraced the white look. Thanks so much! Those footed bowls are just too darling. I had to have them. Kim, you are about at the age of your life where all the junk starts happening to your dishes. One day you have a full set and the next day, you don't even have enough to leave them in the dishwasher! I remember those days well! Even at a fancy restaurant you only get one dish at a time. Nobody really eats from a table set with layers! Even though pictures may tell a different story! Um, I wonder who does that?!! (not, moi). I love a beautifully set table but the most important part is the eating and that usually involves a plate and a chair in front of the TV! Your dishes are really pretty and I love nothing better than mixing them up..Happy Week to you.xxoJudy, BTW, the bowls look like old ironstone to me. I got a large serving bowl from Target that looks pretty much like them. Love it. I love white dishes. I used to have red dishes for the longest, but one day I just got tired of them and I went for all white. I love it so much better. Thanks Vanessa! I really do love the white…and I still have my colors to mix in if I please. Have I mentioned how lately I've been straying towards the whites? I certainly can understand their appeal they go with everything and can stand on their own. Kim, you tell them no more handles are allowed to drop off, they are fantastic! Very pretty! I like your footed bowls - so many uses for them. I have clear glass dinnerware for every day. I've had them for at least a year now and haven't broken anything and scratching is minimal but maybe that's because we are on a vegan diet and use knives minimally. Thanks Ronda! I love glass dishes. I found a roughed up set not too long ago and while I couldn't clean them, they are still stuck in my head. I really would like to find a set. Something about the glass was so elegant...and that's so funny about the knives. I have vegans here. Maybe my new dishes won't scratch!! Here's hoping! Yes, I have white Fiestaware and I really like it except for the marks silverware makes on it. Barkeepers Friend does take it off, but would be nice not having to do that. Like your new set a lot....enjoy. We just bough some Barkeepers Friend for this exact reason. I haven't had an marks yet...but I have a feeling they're coming. Thanks for the tip and the kind comment!! What I like about white is that food always looks good on it and there’s no end to how you can use it.